At the finish of the 2016 North Face Endurance Challenge 50 miler at Bear Mountain, NY. "If one could run without getting tired I don't think one would often want to do anything else"
It was only a little over four years ago that the anesthesia wore off and I was wheeled out of the Rothman Intitute's Riverview Surgery Center in Philadelphia by wheelchair to my car. I had just undergone arthroscopic surgery on my right hip to repair an anterior labral tear. 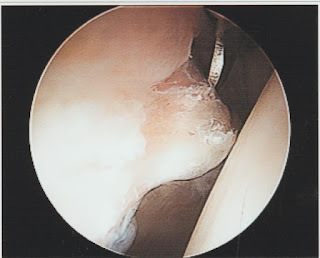 After the surgery, the surgeon had told me that my labrum was shredded due to a bone spur which caused a one way valve to form resulting in a painful cyst. 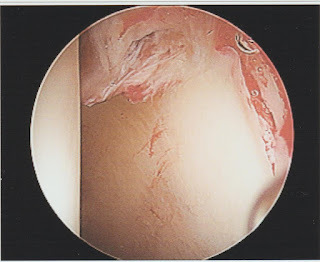 Therefore, the shredded cartilage was cut out, the bone spur was shaved off, and the cyst removed. And hopefully, I was fixed and could return to running. Arthroscopic image of my insides #1. The story begins a bit earlier in 2013 when I began training for what I hoped to be my first ultramarathon. 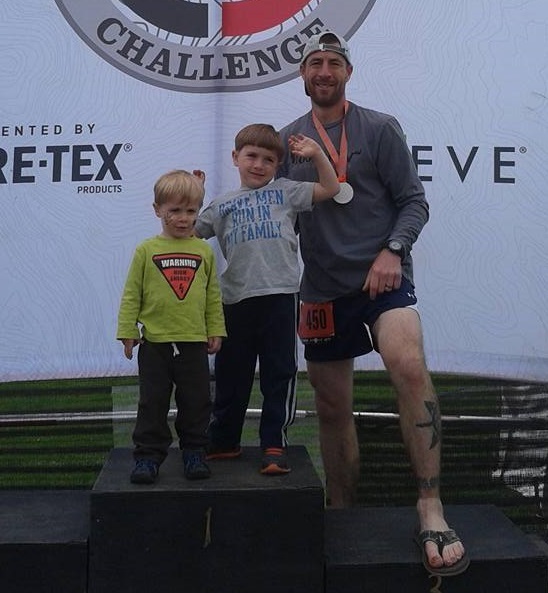 I had been toying with the idea of running an ultra since 2009 when I ran my first marathon, but it took me three years before I committed to the goal and started the training process. Unfortunately, as I began to increase my mileage I was hindered by an unrelenting pain in my hip every time I ran which lasted for several days following the run. After several visits with a few doctors, x-rays, an MRI, and a visit with a surgeon I was given the diagnosis, told my options, and decided corrective surgery was the best option. Arthroscopic image of my insides #2-3. Now, four years later, I am convinced it was definitely the best option. 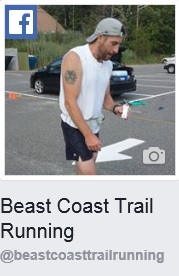 Less than two years after the surgery I ran my first ultramarathon, the 2015 Blues Cruise 50k in Leesport, PA. The following year I decided to test my limits further with the goal of running a 50 miler. Before the end of 2016 I had finished three 50 mile races and one 100 mile race. This year was the greatest test for me and my hip as I aimed to finish the notoriously tough Pennsylvania Triple Crown Series: Hyner 50k, Worlds End 100k, and Eastern States 100 miler. Following the completion of a goal that I had thought about and worked towards for nearly two years I felt a bit empty. After Eastern States I quickly signed up for and ran another 100 mile race, the Tesla Hertz Trail Race. Obviously, I can’t say whether or not I would have achieved all of these ultrarunning goals if I had opted for physical therapy rather than the corrective surgery. I can say with absolute certainty that I was able to achieve them all following the corrective surgery. A feat that would likely have been impossible if I had opted for one of the other options offered by the medical professionals: live with the pain. Arthroscopic image of my insides #4. I’m not saying that a surgery is a fix all or always the best option. I’m just saying it was the best option for me and my injury. Also, it wasn’t an immediate magical fix for me. I spent all of 2014 just building up some base mileage. Returning to running after the surgery was some of the toughest running I have ever done. The difficulty of becoming a runner is something that I believe most avid runners lose touch with. The forced time off following surgery and physical therapy was a stark reminder for me of just how hard it is to take up running. What would have been an easy three mile run before the surgery drained me. Eventually my fitness level returned and I was able to build up my endurance for longer distances. As frustrating as it is to work hard to get back to where you already were, the substantial and fast gains you witness along the way are the ideal motivators to keep at it. As grateful as I am for how well the outcome of the surgery was and being able to run long distances without the debilitating pain that I was experiencing in my hip, the mental game of rebuilding that I went through was beneficial for ultrarunning as well. It improved my mental fortitude to deal with the low points in long, tough races. It made me grateful to have the ability and desire to run. It proved to me that the desire to run long distances was still there and that I wasn’t hiding behind an injury as an excuse. Maybe most importantly, it spawned a new respect within me for everyone who has ever taken up running as a sport or hobby. Until I was forced to have to rebuild my running endurance, I took it for granted and had forgotten how hard I had worked to get to that level. I hope to always maintain that gratefulness and never forget again how difficult it is to start the journey to run long distances. Arthroscopic image of my insides #5-6. I would like to give a sincere thank you to everyone who helped me throughout this process including all of the medical professionals, especially Dr. John P. Salvo Jr. who performed the surgery. Also an extra special thank you to all of my family, especially my mother-in-law, that helped out during the recovery time when chasing my almost two year old son around on crutches was a bit of a challenge.